The stars of Warner Bros.' Crazy Rich Asians dressed to impress when they posed for photographers at the world premiere at Grauman's Chinese Theatre in Hollywood last night. E! News was on the scene, where director Jon M. Chu spoke about bringing Kevin Kwan's novel to life on the big screen. "On a personal level, it is everything. My whole life, my parents have said, 'Do stories about your culture.' Growing up, I'm like, 'No! I don't want to do [those] stories. That's the most sensitive part of my soul!' But as you grow as an artist, you realize those are the things you are supposed to do as an artist," Chu said of the "amazing" and "empowering" shoot. It's also why he turned down a lucrative offer from Netflix, as he wanted to give fans of Kwan's story a richer experience. "It's worth leaving your house, fighting traffic, standing in line, sitting in a dark room and saying, 'Tell me a story,'" he said. "We are worth that energy and that time." 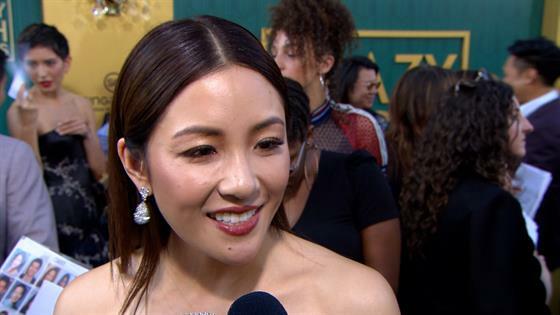 Is a "Crazy Rich Asians" Sequel Coming? E! News also talked to Henry Golding and Constance Wu, who play longtime loves Nick Young and Rachel Chu, respectively. "This is insane. Is this not crazy?" Golding said. "The turnout here is phenomenal." Wu, the film's leading lady, added, "This honestly feels like the privilege of a lifetime. I'm so grateful and so lucky to work with such a talented cast and crew, to be here in this moment and doing what I love, and trying to help other people do what they love as well." Kwan's story continued with the book China Rich Girlfriend, but will there be a film sequel? "It's up to the audience. If people show up opening weekend, we would love to tell more stories," Chu told E! News. "We'd love to also have other people tell their stories, as well. So...we'll see!" Crazy Rich Asians is in theaters Aug. 15. For more from the star-studded premiere, watch E! News tonight at 7 and 11, only on E!